The Zavio CamGraba NVR surveillance software gives users the ability to manage and record their Zavio IP cameras on a local network. Another great feature of CamGraba is the option to control PTZ cameras. Users can manually control the PTZ or set up a preset tour to run automatically. The camera used in this article was the Zavio-P5110 (Wireless Version - Zavio-P5115). The instructions below explain how to set up a Zavio PTZ camera on the CamGraba surveillance NVR software. 1. 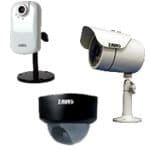 Make sure the Zavio IP PTZ camera is connected to the same network as the PC you have CamGraba installed on. Then launch the CamGraba program. 3. Then go to the Camera tab and click Search.